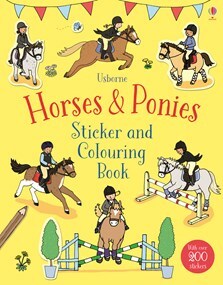 A sticker and colouring book full of horses and ponies in scenes showing grooming and horse care, show jumping, gymkhanas and riding competitions. There are over 200 stickers to add of riding clothes, rosettes, different horse breeds and lots more. The background on each page is already coloured in, so children can focus on colouring fun details.